The jacket foundations, from beside the Sam Thompson Bridge, Victoria Park. The building dock in Belfast was constructed between 1968-1970 by George Wimpey & Company for the Harland and Wolff shipyard in Belfast. A massive 556 metres long by 93 metres wide, it was designed for the construction of massive crude oil tankers and bulkers. Although many ships were constructed here, including two supertankers of 172,174 tonnes (343,423 DWT), the yard was in decline by the early 1970s and the dock never really fulfilled its potential. The last ship to be constructed was the 'Anvil Point' in 2003 and the yard now specialising in ship repair and the emerging renewable energies sector, notably offshore wind turbines and tidal energy projects. 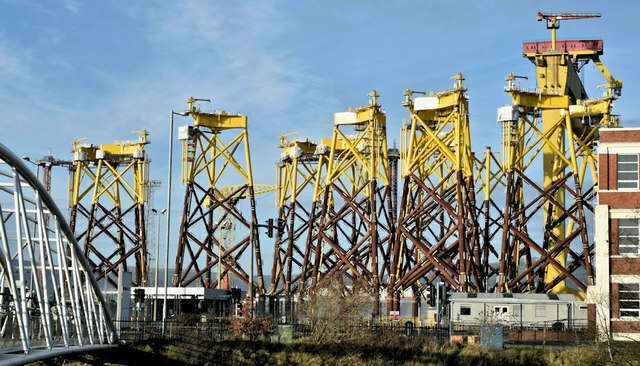 Towering above the dock are the two gantry cranes 'Samson' and 'Goliath'. Now landmarks on the Belfast skyline, the cranes were designed for the yard by the German firm Krupp. Goliath, completed in 1969 and mostly fabricated by the yard, stands at 96 metres and Samson, completed in 1974 and built entirely by Krupp, is taller at 106 metres. Both cranes have a span of 140m and have a safe working load of 840 tonnes each (though I believe were tested for 1,000 which caused the top girders to bend downwards by some 11 inches). They run on 800m of track which spans the length of the dock and each crane has 64 special anti-friction bearing mounted wheels. Both the dock and the cranes are now protected scheduled monuments. See Link for technical information . Link in an informative video from the BBC. Both Ørsted (formerly DONG) and Harland & Wolff produce wind turbine parts within the Belfast Harbour Estate. This collection shows some of the parts and the vessels used to transport them at sea.